Today we all took a trip into Melbourne to catch up with a few exhibitions. We started with the State Library of Victoria's Heroes & Villains (which includes one of my early comics and is dealt with in a previous post). Then we checked out the Myer Christmas windows, which were doing Wombat Divine (a rather strange Nativity, acted out by Australian animals), with animated puppetry, as usual - this one worked particularly well. Then we went on to the Tezuka: the Marvel of Manga exhibition at the National Gallery of Victoria, which is on until 28th January. 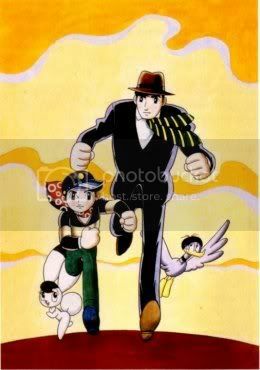 While Tezuka Osamu is well-known from many familiar anime, such as the cartoons Kimba and Astro Boy, he is also an icon of Japanese manga - an absolute master and forefather of the form. I chose the Amazing 3 here (known as "Wonder 3 (Wanda suri)" in the Exhibition), as this cartoon is among his less-remembered work these days, though familiar from TV way back when :). There was an astounding range of original pages from across the full range of Tezuka's work, both in colour and black-and-white. Among my favourites were the pages from Ludwig B, which explode with imagination as they attempt to express music in visual form. It was truly heartening to look over these pages, with their crisp precise inkwork and superb draughtmanship, but also plenty of white inking to correct and alter (I smiled with recognition upon seeing some pasted over faces and eyes - getting manga eyes to match and look right can be truly difficult at times). It was also wonderful to see how small these originals were, given how used we in the West have become to drawing our comic pages at A3 size. For my children's magazine work these days I draw at scanner-friendly A4, which is similar, so it was pleasing to find that it's also actually traditional for manga! Much of the material was suitable for older audiences only, so anyone taking small children into this exhibition would do well to stick with the familiar characters (while sneakily browsing the rest). This one is definitely worth getting to! P.S. Tezuka's Phoenix would be relevant to this week's Illustration Friday. How I wish I am living in Australia.